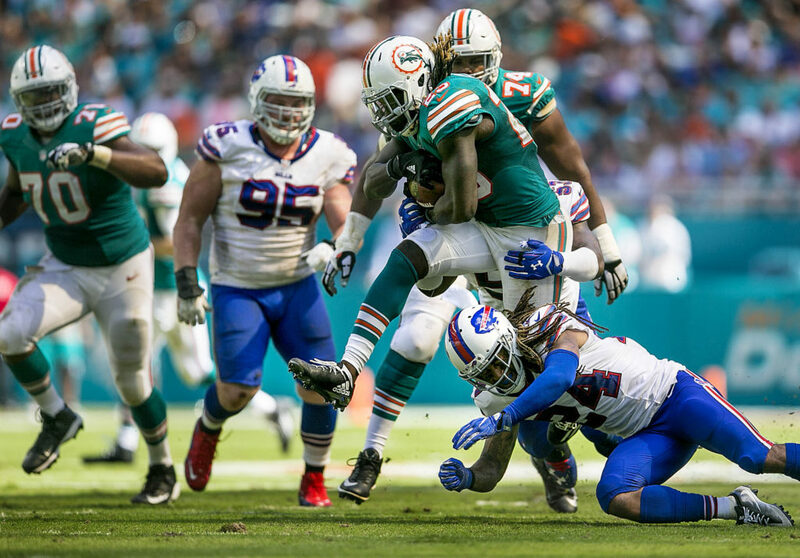 Just when you thought RB Jay Ajayi’s 204 yard performance on the ground against the Steelers was a fluke, he becomes one of four backs ever to rush for 200+ yards in back to back games with 214 yards on 28 carries and a touchdown in the 28-25 victory against the Bills on Sunday. Ajayi joins OJ Simpson, Earl Campbell and Ricky Williams in RBs with consecutive 200+ rushing yard performances. The second-year running back from Boise State, is the only NFL rusher with a 200-yard game this year. Miami trailed by 11 points late in the third when Ajayi punched one in from four yards out to make it 14-17 (with the two-point conversion pass to Landry). Buffalo’s lead was due to a ten yard TD run by Tyrod Taylor, and a 67 yard TD pass from Taylor to Marquise Goodwin. Damien Williams cashed in from a dozen yards out to give Miami a 21-17 lead with 3:56 left in the game, his second score in as many weeks. The next Dolphins possession Ryan Tannehill took a shot, on 3rd and 8 with 2:24 left and one timeout in Rex Ryan’s pocket, the Dolphins quarterback dropped back and flung a deep ball that was caught by Kenny Stills for a 66 yard touchdown to put Miami up 11. The Dolphins 22-0 run was stopped when Reggie Bush scored from one yard out with 14 seconds left, as the Dolphins finished it 28-25. Here are the final stats from the game at Hard Rock Stadium. Another notable performance from a Dolphins player includes Jarvis Landry’s 78 yards receiving on five receptions. The defense stood tall against a Buffalo team that had won four in a row, including victories over the Cardinals and Patriots, and averaged 31 points per game in that winning streak. 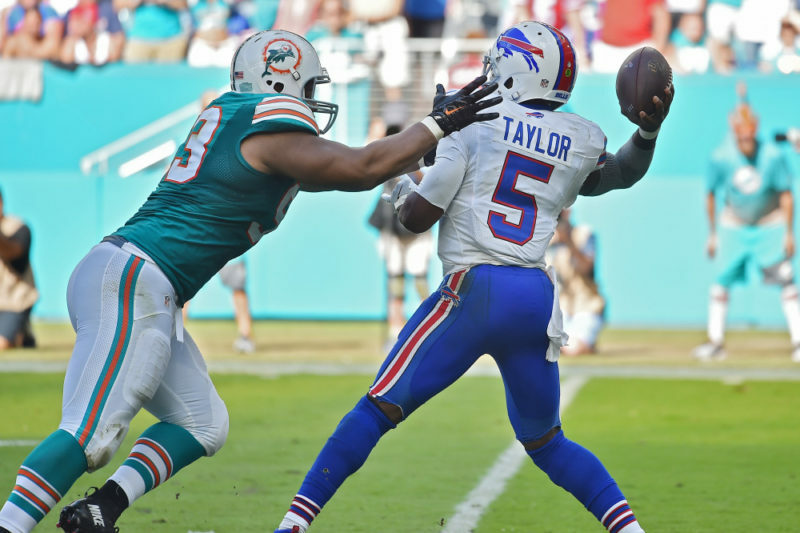 The Dolphins outgained Buffalo 454 to 267 yards, and their four sacks tied a season-high for Miami. 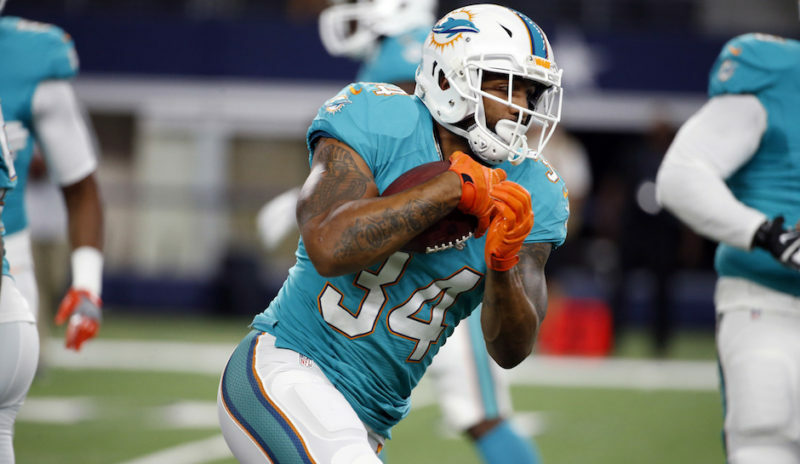 Running back Arian Foster has officially retired, Foster is 30 years old and is a four-time Pro Bowler, two-time NFL rushing touchdown leader and lead the league in rushing yards in 2010. Foster had 55 yards this season on 22 carries, in the four games he played in. He had six catches for 78 yards. Coach Adam Gase spoke about the resiliency of his team, a team that has beaten the Steelers and Bills in consecutive weeks and sits at 3-4 heading into their bye. Miami’s next game is November 6th at home against the New York Jets (3-5). Daniel Gillman is a play-by-play broadcaster, and a graduate from the University of Florida. He is currently the radio play-by-play broadcaster for Purdue Boilermakers volleyball. He worked two years as a play-by-play broadcaster for the Gators IMG Sports Network, calling softball, lacrosse, volleyball, and soccer. Most recently, Daniel broadcasted the NJCAA D1 Women’s Basketball Championship on CBS Sports Network with Sheryl Swoopes. Copyright © 2019 Daniel Gillman All Rights Reserved.